A great piece of social realism. The suject is powerful and just as timely today as in the great depression. The lines of downtrodden humanity stretching out to who knows where. The buildings in the background show great control of the multiline tool. I’m just beginning to use them in my engraving and it is really tricky to maintain even pressure on a long cut. The figures in the foreground are supple and lively. I can only dream of becoming that skilled at cross-hatching. Thanks for your observations Neil. This beautiful engraving can’t help but to inspire and encourage us all. You correctly point out that the subject matter remains relevant and equally poignant today. A timeless work by a master of the graver. I might have to disagree with the idea that the building shading was done with multi-line tool. I would wager a pint that a single graver under the dexterous control of Ms. Leighton was the culprit. I hope to make her book available as a flip book in my library section. If you’re ever in Olympia, Washington, look me up for that pint – I owe you! It’s strange, but I think my computer monitor at work really accentuated the hatching in one direction. I’m using a different computer at home and I can see the cross-hatched shading on the buildings much more clearly. The flip books on your website are great! 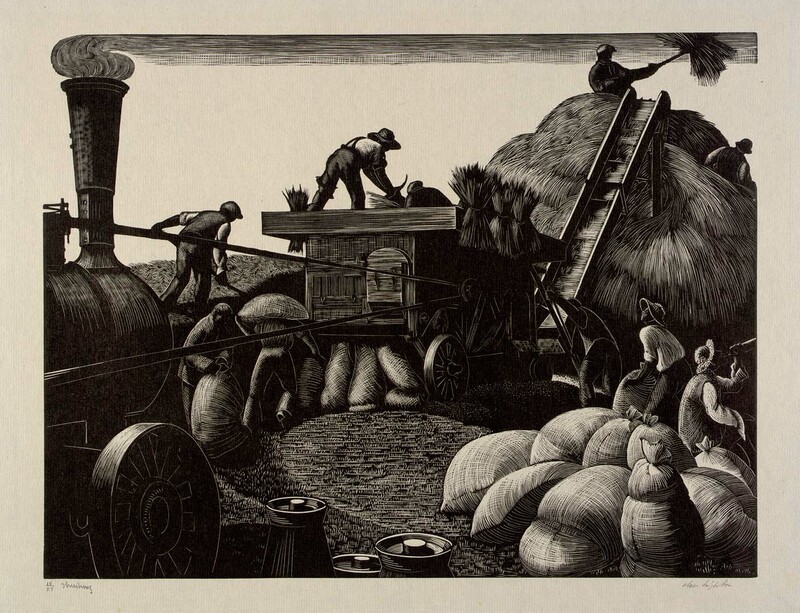 Found a signed engraving title “Corn Pulling” today and knew it was done by a gifted artist. The level of detail is truly amazing. 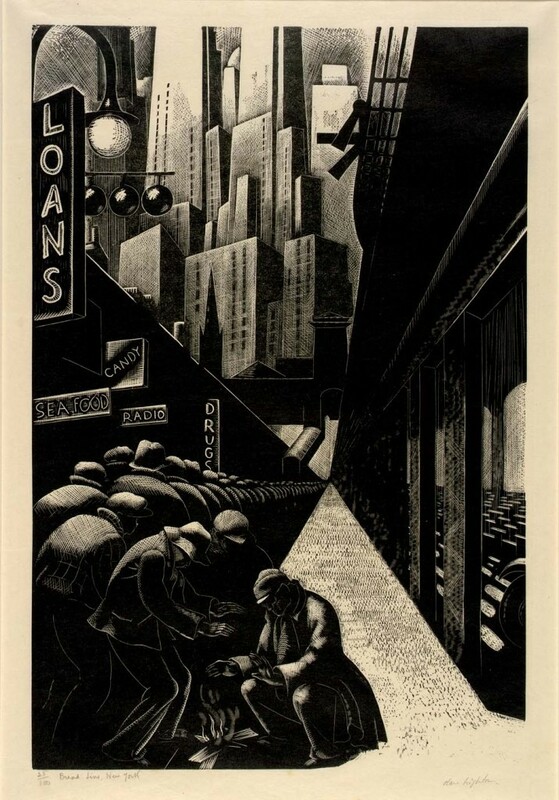 I stumbled on your posting of “Bread Line” which reflects an urban sensibility that I had not seen in the more rural images my web search conjured up till I reached yours. Am I right in thinking that to create these powerful works, the artist needed to remove material, like working in reverse to achieve the desired effect in the print. Again, truly amazing! Thanks so much putting it out there. Marty, thanks for your comments. The detail that can be achieved with this medium is astonishing. Unfortunately it doesn’t translate completely to the digital screen, only real live viewing does it justice. The “thinking in reverse” conundrum becomes a problem when the artist looses track of the positive space versus the negative when engraving a block.Happily, the quality of the drawing will lessen chances of getting confused. Clare Leighton’s work lives on as a shining example of wood engraving mastery.